While I've kept major plot details for the fifth season to a minimum, please be aware that there are some spoilers for the show's previous four seasons. Be sure to read our reviews for seasons one, two, three and four! After constant struggles with ratings and last minute renewals, NBC's 'Chuck' finally comes to an end with its fifth and final season. Thankfully, the writers were informed of the show's fate before production began so fans could get a proper send off for the characters they've come to love. So, do the writers pull it off? Does 'Chuck' go out with a bang or a whimper? Does the lovable geek spy get to live happily ever after? Well, I won't be giving anything specific away, but I am very happy to report that the show does indeed go out on a strong note, and the writers do the series justice by turning in another entertaining set of episodes. That's not to say that there aren't some bumps along the way, but by and large, the fifth season of this cult favorite succeeds in giving the Bartowski's and their extended family of misfits a proper conclusion. At the end of the previous season, Chuck (Zachary Levi), Sarah (Yvonne Strahovski), and Casey (Adam Baldwin) severed their ties from the CIA and vowed to start up their own private spy firm. At the same time, Chuck's best friend accidentally downloaded the intersect into his head, granting him nearly unlimited spy knowledge and physical skills. Season five picks up a few months later, and immediately deals with Morgan's newfound abilities and the team's attempts to make a name for themselves in the espionage world. Unfortunately, it seems that Morgan's version of the intersect might have a few glitches, and a new conspiracy arises from within the government that's hell-bent on taking out Chuck. Now just an ordinary guy, Chuck will have to prove that he's just as capable at being a hero without the intersect, or his family and friends may pay the ultimate price. With a truncated thirteen episode order and an end date in sight, season five carries a certain momentum that other season's lack. The writers continue to blend comedy, action and romance wonderfully, turning in scripts that run the full emotional gamut, without ever losing sight of the show's inherently fun sense of humor. Morgan getting the intersect, and the team's new private business do inject a bit of fresh life into the show, but the plotlines remain standard 'Chuck' fare, taking us on exciting missions to both exotic and mundane locals. Just as important as the missions, are the personal relationships between the characters, and the idea of family becomes a big emphasis for season five. Chuck and Sarah's adjustment to marital life and plans for the future guide many of the storylines, and the rest of the supporting cast continue with their own personal subplots -- all tied into the show's grand theme of growth. The series is known for its eclectic mix of guest stars, and this batch of episodes delivers in spades. Carrie Anne Moss, Danny Pudi, Rebecca Romijn, David Koechner, Linda Hamilton, Bo Derek, and even Stan Lee all make appearances. Moss, in particular, is a welcome inclusion to the show and takes on a multi-episode role as a rival spy and potential love interest for Casey. A long deceased character also makes a cameo in a flashback, and one of my favorite villains makes a brief return to wreak havoc for our heroes. As much as I enjoyed the show's send off, the season isn't perfect. The accelerated pacing can lead to some plot points getting skimmed over and wrapped up too quickly. This gives the season a sort of choppy feel as we move from one threat to the next. While Jeff and Lester continue to be amusing, their presence in the first half of the season still feels a bit superfluous. Thankfully, the writers actually do something fairly interesting with the duo later on, which culminates in the most important "Jeffster!" performance of their lives. Though I think the actor who plays the season's ultimate villain is great, as written, the character is never very convincing and lacks the personal touch that makes Chuck's most notable enemies so memorable. Also, certain developments in the last three episodes feel a bit contrived, and, without giving too much away, a big twist involving Chuck and Sarah's relationship seems like a forced attempt to make the finale as emotional as possible while sacrificing many developments made over the past five years. While I have mixed feelings about some of the finale's plotpoints, there is no denying the last episode's emotional power. Filled with loving nods to previous seasons (both subtle and blatantly overt) the finale really knows how to tug at its viewers' hearts. The show comes full circle on its themes and offers a very satisfying, though surprisingly ambiguous conclusion. Despite my reservations about Sarah's "developments," the show's closing scene is simply beautiful and wonderfully romantic, and Yvonne Strahovski's delivery of the final line is pitch-perfect, telling audiences everything we need to know about these characters and their potential futures. For five years 'Chuck' provided a small, but very loyal fanbase a unique blend of comedy, romance, action, and adventure. In the fifth and final season, the writers do a great job of taking the story full circle, offering those dedicated viewers a fitting farewell. I've stuck with the show since its premiere, and though there have been some ups and downs along the way, I am genuinely sad to see it go. Where will I get my spy/action/comedy fix now? For those who have never seen 'Chuck' before, I definitely recommend checking out the first season and going from there. It's a fun and worthwhile ride. Warner Bros. presents 'Chuck: The Complete Fifth Season' on two BD-50 discs housed in a keepcase that comes packaged in a cardboard slipcase. After some logos and warnings, the discs transition to standard menus. All thirteen season five episodes are spread out over the two discs. A helpful insert is also included in the package with details on each episode and the various special features. A code for a redeemable UltraViolet digital copy is included as well. The show is provided with a series of 1080p/AVC MPEG-4 transfers in the 1.78:1 aspect ratio. Anyone who's seen previous seasons on Blu-ray will know exactly what to expect here. Serviceable yet uneven, these transfers get the job done but are subject to the shooting style's inherent limitations. The 16mm source is in good shape, but there are some minor specks here and there. Grain levels fluctuate wildly from episode to episode (and often even shot to shot), sometimes looking nicely textured, and other times looking extremely thick and noisy. Very minor smearing is evident from time to time as well. Detail is decent but the series has a predominantly flat quality that lacks true dimension. Colors also vary a lot, usually veering toward a very bright and vivid palette, though sometimes at the expense of natural skintones. Contrast is high and occasionally blown out, and black levels are deep but shadow detail can crush. I noticed some slight banding in a shot or two, but excessive compression artifacts are thankfully nowhere to be found. 'Chuck' has never been an impressive series on Blu-ray, and this final season is no different. The image can definitely look good, but its inconsistencies prove to be a little bothersome. Like season four, Warner Bros. once again provides a solid set of lossless DTS-HD MA 5.1 tracks (the first three seasons all featured lossy audio). Though not up to par with feature length action films, the audio is definitely exciting and lively when it needs to be. For the most part, dialogue is clean and crisp, but there are few moments when speech can sound just a tad muffled. Effects work is strong with nice directionality and smooth imaging. Surround activity offers decent but not great atmospheric work. With that said, rear activity really comes to life during the action scenes. Punches, bullets, screeching tires, explosions and the series' trademark "flashes" all provide a fun burst of auditory immersion. The show's thumping original score and indie rock music also come through strongly. Unfortunately, there are instances where the effects work and music can sound a bit too aggressive, with a thudding low end that slightly overpowers the rest of the mix. Thankfully, the majority of the audio is balanced well. Like season four, season five of 'Chuck' sounds pretty good. A more enveloping sense of ambiance in non-action scenes would have been nice, and some of the design choices can get a little too forceful, but overall fans should be very pleased. Warner Bros. has put together a decent collection of supplements including deleted scenes, featurettes, two commentaries, and lots of crying. All of the special features are presented in 1080p with Dolby Digital 2.0 sound and optional English, Spanish, and French subtitles unless noted otherwise. Declassified Scenes (HD, 3 min) - Two deleted scenes are included and are available to view separately via icons next to their respective episodes or under the special features menu. These are both pretty skippable and don't really offer much value. Sandwiches and Superfans: The Saving of a Show (HD, 10 min) - Presented in 1080i, this is a series of cast and crew interviews focused on the show's loyal fanbase and the campaigns they launched to help keep the series on the air. The participants all seem very thankful for the love and support of their viewers and it's nice to see that a small, but dedicated fanbase can actually make a difference. Scoring the World of Chuck (HD, 6 min) - Here the focus is on the show's composer Tim Jones and the various techniques he uses to create the series' themes and musical styles. Buy More Commercial Big Mike (HD, 1 min) - Big Mike's retro Buy More commercial is included in all its glory. Buy More Commercial Captain Awesome (HD, 1 min) - Captain Awesome's Buy More commercial is included in its entirety. Audio Commentaries - Creators Chris Fedak & Josh Schwartz, and stars Zachary Levi and Joshua Gomez provide commentary together on "Chuck Versus Sarah," and "Chuck Versus the Goodbye." The participants share lots of anecdotes about the show's five year run and spend most of the time praising the rest of the cast and crew. A few bits of interesting trivia are also touched upon (Devon was originally supposed to be a Russian spy) and the various callbacks to earlier episodes littered throughout the series finale are all pointed out. The final track also gets bonus points for an amusing 'Teen Wolf' reference. Fans should definitely take a listen. Declassified Scenes (HD, 8 min) - Eight mostly superfluous deleted scenes are viewable via icons next to their respective episodes, or in a separate menu. With the exception of one humorous scene between Morgan, Ellie and baby Clara, these are all skippable. Chuck Versus the Final Episode (HD, 14 min) - Lots of emotional on set interviews with the cast and crew are provided during the shooting of the final episode. Some behind-the-scenes material focused on the stunts are also shown. Extended Version of Chuck Versus the Goodbye (HD, 53 min) - An extended version of the series' final episode is included with nine additional minutes of previously excised material. It should be noted that a standard Dolby Digital 5.1 track is the only audio option. Chuck: The Beginnings (HD, 5 min) - The show's origins are discussed along with some clips from previous seasons. The most entertaining part of this is getting to see how much Chuck and Morgan's hair has changed through the seasons. Chuck: Through the Years (HD, 11 min) - Here the cast and creators breakdown the evolution of the main characters and the actors who portray them. Everyone pretty much agrees that Zachary Levi has basically just been playing himself. Chuck: The Future (HD, 4 min) - The cast and crew discuss where they see their characters heading in the future. Gag Reel (HD, 4 min) - A fun but forgettable reel of flubs and outtakes is included. Goodbye Buy More (HD, 2 min) - This is a cool time lapse video showing the Buy More set getting torn down. 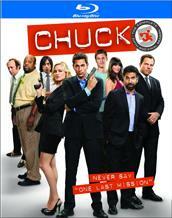 'Chuck: The Complete Fifth Season' offers fans of the show a fitting conclusion to the cult favorite series. The writers provide plenty of laughs, action, and romance throughout the thirteen episodes, and though there are a few minor stumbles, the show ultimately succeeds. Video quality remains as uneven as past seasons, but the audio continues to uphold the improvements made in the previous set. Supplements are informative and emotional, revealing just how much the show meant to the cast and crew. This is a solid set for a good series that I'm sad to see go. Recommended.